HA NOI (VNS) — The National Assembly House design by German company gmp International GmbH has just won the Grand Prize 2014 of the Viet Nam Architects' Association. 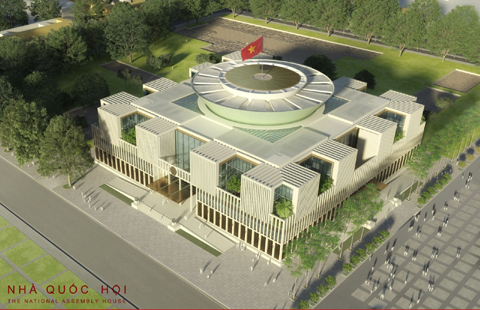 The jury highly appreciated the design for its actual use capacity, while blending well with the surrounding environment and other important buildings considered to be the capital's symbols such as the Ho Chi Minh Mausoleum, the Bac Son Martyr Monument and world heritage site Thang Long Citadel Complex. The company, founded by Meinhard von Gerkan and Volkwin Marg in 1965, now has eight more partners. At present, gmp is involved in projects in various countries such as China, Russia, Viet Nam and Italy, besides the United Arab Emirates. The HCM City-based a21 Studio led by architect Nguyen Hoa Hiep also won three prizes for their buildings in the residential house and public design categories.